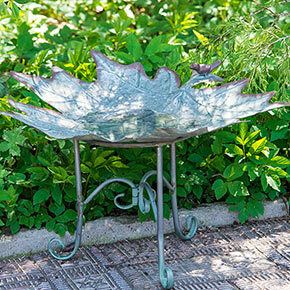 This petite birdbath has such a graceful design. 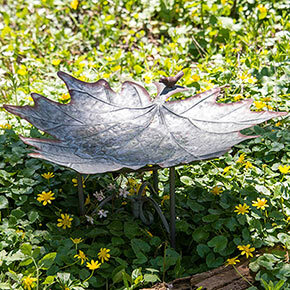 In use, it looks as if wild birds are perching on the edge of a cupped maple leaf that's just fluttered down into your backyard. Although the style is delicate, the material is sturdy galvanized metal, which resists rusting. The basin is firmly attached to the base at three points, and won't move or startle its visitors. This diminutive size fits the edge of a little patio or a smaller garden space—far enough away that shy birds will check it out, and close enough that you can enjoy birdwatching. W19"xL19.75"xH12.5"